Saint Louis University lives to see another day. Tramaine Isabell’s 24 points led the way as SLU triumphed over the Dayton Flyers to get to A-10 Tournament semifinals and, far more importantly, win the season series in the ArchBaron Cup. Despite effectively playing 6 players(Dion Wiley played 5 minutes and KC Hankton played the last 44 seconds of the first half), the Billkens played with sustained effort throughout the game and ended up with a somewhat comfortable win by Billikens standard. As is becoming typical, Tramaine Isabell lit an offensive spark under the Billikens, and was their only effective offensive player for much of the first half, scoring 15 points. Isabell and Jordan Goodwin’s four putbacks from offensive rebounds accounted for almost all of SLU’s offense in the first half. The Billikens’ offense caught fire in the second half, as the team shot 57 percent from the field. Javon Bess, who’s struggled offensively of late, scored 10 points in the second half, nailing a couple of mid-range pullups and going 4-5 from the line. SLU pulled away to a 7 point lead when Jordan Goodwin hit a rare three pointer, Bess got a steal, and then Hasahn French sunk a little hook shot with 3:28 to go. “I think we just rose to the occasion. Coach just told us keep pushing, keep pushing, and we got the win, so I’m happy with the outcome” said Isabell. SLU shot 10-15 from the line. 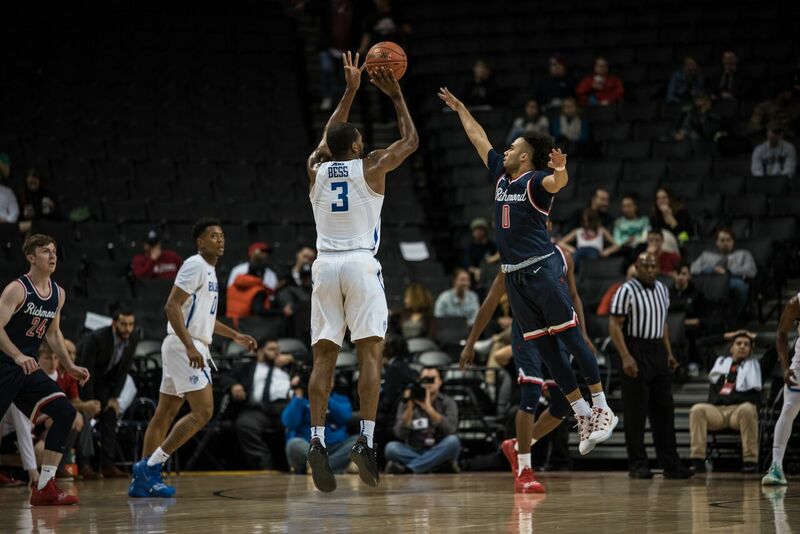 66 percent would be bad for most teams, but this represented a huge improvement for the Billikens of late, and made a big difference in the win. Ford once again went to the team’s 13 defense, and once again it worked wonders, putting pressure on Dayton and injecting the team with a lot of energy. Over the course of the game, SLU scored 22 points off turnovers to Dayton’s 14, and had 13 second chance points. “We pride ourselves on defense, and defense isn’t just man to man. It’s 1-3-1, it’s zone, it’s everything, so we work on all of it and we’re confident in it” Goodwin said about the team’s 13 defense. In addition to Tramaine Isabell’s 24, Goodwin poured in 17 points and 9 rebounds. He was a junkyard dog and Dayton could not put a body on him down low. DJ Foreman also had a fantastic game on the boards, notching 9, with 3 coming on the offensive end. Foreman’s hustle might go a little unnoticed because Goodwin often came up with the ball, but his scrapping and boxing out made a huge difference for SLU. Next up, SLU will face Davidson at 3:30 on CBS Sports Network. Here are some keys to the game, and yes I did just copy and paste this from yesterday’s article and just add one more BECAUSE IT STILL RINGS TRUE. There’s not a lot of nuance to this team’s success honestly. Their best can beat just about any team in the A-10 straight up if they execute. Hit at least 60 percent free throws: It’s really hard to win when you only hit 60 percent, but if you’re under, you’re done for. SLU just barely hit the 50 percent mark this game, but they’ll need to do better if they’re going to take the final ArchBaron Cup of 2019 and move on in the A-10 Tournament. Stop Jon Axel Gudmundsson: Kellan Grady is probably the more talented scorer, but JAG is the A-10 MVP for a reason. He is the engine for this Davidson team and everything goes through him. SLU needs to find a way to take him out of the game, as opposed to just trying to stop him from scoring. It’s going to be a tough matchup, but if JAG is neutralized, the Bills have a much easier chance at a win.